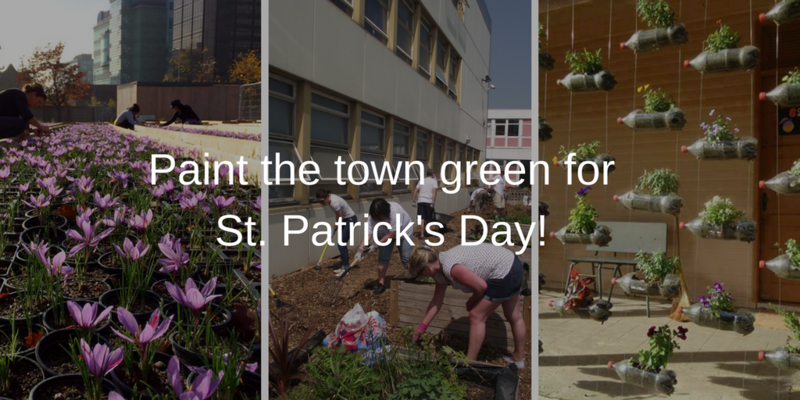 This St. Patrick’s Day we’re raising the bar (not the drinking kind) and setting towns and cities across the country the challenge to think green for the day and come up with new and exciting ways to bring more green spaces to life! Whether it’s park improvements, pop-up gardens or growing spaces – we want you to share your great and green ideas. And as soon as you’re ready to bring your Paddy’s Day plans to life, we have a number of great funds on offer that could help. Veolia, Growing a Greener Britain, Better Communities, Barclays Life Skills and Our Manchester are just five of our Spacehive partners supporting green space projects crowdfunding on Spacehive. Veolia want to support small projects which will make a big difference to help the community increase reuse and recycling and they’re offering up to a thousand pounds in cash, in kind resources and staff volunteers for green projects around London. Better Communities is a new initiative from social enterprise GLL and supports projects which encourage local people to be active, learn and play together – this could include community gardens, outdoor sports facilities or children’s playgrounds. They’re offering pledges of up to £5,000 along with skills from their staff and stuff from their centres to projects that want to do the same. Barclays Life Skills is using Spacehive and crowdfunding to get young people running campaigns that develop skills such as marketing a project, writing press releases, creating videos, and pitching to local businesses. If your team includes young people between the ages of 16 and 24, you could earn a pledge of up to £500 to bring your green project to life. Our Manchester supports projects in the City of Manchester which have a focus on improving parks and green spaces and encouraging residents to be physically active outdoors. They’re offering pledges of up to £5,000 to projects that will improve Manchester’s existing green spaces and natural environments. Check out these great green space projects who received support and funding from our partners before going on to successfully hit their targets! Croydon Saffron Central raised over £4,000 from 107 backers in a record five days to transform a disused plot of land into a pop-up crocus garden providing saffron for the whole community. Heaton Park Community Orchard raised over £12,000 from 83 backers, including Our Manchester, Growing a Greener Britain and the Esmée Fairbairn Foundation, to create a working orchard that engages local young people and the wider community. Abundance at Edible York raised over £4,000 from 84 backers, including Growing a Greener Britain, to pick surplus fruit in York and distribute to local people with the greatest need. Discover more exciting green space projects here. And Happy St Patrick’s Day from all of us here at Spacehive!